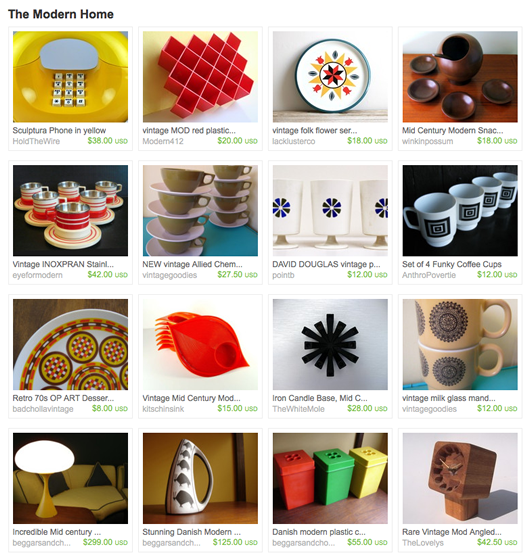 Etsy’s Treasury is something I’ve been fascinated by for a while. It’s an ever-changing, member-curated shopping gallery with some unique constraints. Treasury lists only live for 48 hours. Each list has a limit of 42 comments. You can only create a list if the total number of lists falls below 333 (shorthand for according to Wikipedia). And you can only have one list living at a time. These constraints create scarcity, which makes the opportunity to create a Treasury list more desirable. The constraints also help to give the Treasury a “live” feel—what you’re seeing in the Treasury and sharing with other visitors is ephemeral, and will soon go away. As we used to say, “Embrace the decay!” Plus there are some real-time aspects to the Treasury that are rare on the web: When you’re viewing a list, you can watch other people’s clicks as they happen—the items are highlighted in yellow for other visitors the moment they’re clicked. Each list is a temporary, shared space. You can see this in the Treasury list URLs, which contain a “room_id.” The lists are rooms, and you always know how many other people are in the room with you. In the early days, this was made explicit from the start, and you could watch other visitors fly into rooms from the main Treasury page. In other words, everything that makes the old Treasury unique is related to the fact that it’s a Flash application: its constraints, and its real-time feel. These things are inseparable from its origins in Flash. But at Etsy an entirely new infrastructure for collections is being created, powered by MongoDB. So we launched Treasury East as a testing ground for a new unlimited Treasury world, where anyone would be able to create a curated list of items, and that curation activity would be rewarded and harnessed as the important signal it is in a marketplace of one-of-a-kind items made by humans. Etsy is filled with things you never knew existed and never knew you wanted. People welcome guidance and clues from other people in this environment. And the birth of Treasury East has been remarkable. It feels like the flowering of something new and great, as fascinating items and shops are surfaced by people with a talent for finding things. Already we’re seeing games emerge organically, some reminiscent of the Etsy Sneak Attack and PIF (Pay It Forward) phenomena, like Treasury East BnR (Buy and Replace), started by Grace of Homespun Handmaiden. BnRs are bemoaned in the old Treasury world but in this new environment they start to feel like a primitive social-commerce life form that might evolve into something more interesting. OK I’ve started a treasury east that’s a BnR (buy and replace). Basically you can buy any of the items in the treasury and post the transaction link in the comments. I then go to YOUR shop and replace the item you bought with one of your items! It’s a win-win for all involved. This is a great way to promote your shop and support fellow etsians at the same time! Keeping an eye on the constant stream of Treasury East blog mentions and Twitter mentions for more. Treasury East… oh, the possibilities!